The Kingdom of Jerusalem and the other Crusader states, with Muslim states (in shades of green) in 1135 during the reign of Melisende. Someone may have paid the Assassins to kill Raymond, although they had never been known to target Christians. Or he may have done something to antagonize them. It’s also possible that he was assassinated by people dressed as Batini or using their methods. They could have been supporters of Bernard, the illegitimate son of the count of Toulouse, Alphonse-Jordan, who also claimed the lordship of Tripoli. Bernard had recently died under suspicious circumstances and it has been hinted that Raymond had something to do with his demise. No one seems to have suggested that Hodierna sent men to murder her husband. She does not seem to have had the force of will of her older sisters, but it is interesting that the attack came just at the point when she had decided on a separation. On receiving the news, Hodierna immediately returned to Tripoli with her children, Raymond and Melisende. Raymond was about twelve, close to the age Baldwin III had been when Fulk died. King Baldwin ordered that all the nobles of the land swear allegiance to Hodierna and her children. She assumed the regency of Tripoli. Since she wasn’t the heiress, no one seems to have demanded that she remarry for the defense of the county. Perhaps Guillaume Duc, viscount of Tripoli, assumed that responsibility. It was also possible that Raymond had been involved in a dispute with another faction in Tripoli. The composition of the county was much different from Jerusalem or Antioch. The “Franks” were mainly Provençals, and spoke a form of French very different from that of the northerners. There was a large Italian contingent, many from Genoa, including the lords of the town of Gibelet, who gave military assistance when required but were mainly engaged in trade. The main Jewish community of the county was also in Gibelet. Tripoli produced a number of luxury goods. It was famous for the silk made there along with a dye made from rose madder, grown in the region. Sugar cane was grown and processed and soap and oil made from olives. The wines from the grapes of the surrounding countryside were considered excellent. Citizens also wove cotton and carpets (something not common in the West) and made high-end glass and ceramics. In this manufacture, Jews, Syrian Christians, and even a few Muslims became rich. Tripoli was probably the most cosmopolitan of the Latin States. In the mountains of the county lived the Muslim Druze and some Ismali’ites, who may have been part of the Assassins. The largest Christian group was the Maronites, whose dogma had formed in the seventh and eighth centuries. They followed the Eastern rite of the church but, as early as 1182, reunited with Rome and acknowledged the pope as head of their faith. Most of the Christians of Lebanon today still follow Maronite practices. Hodierna’s regency was intended to preserve the count’s share of the wealth for her children. Her understanding of the diverse population helped her to govern. It was likely through her influence that Raymond III and Melisende became fluent in Arabic. Baldwin was now titular regent of Antioch and Tripoli, as well as king of Jerusalem. 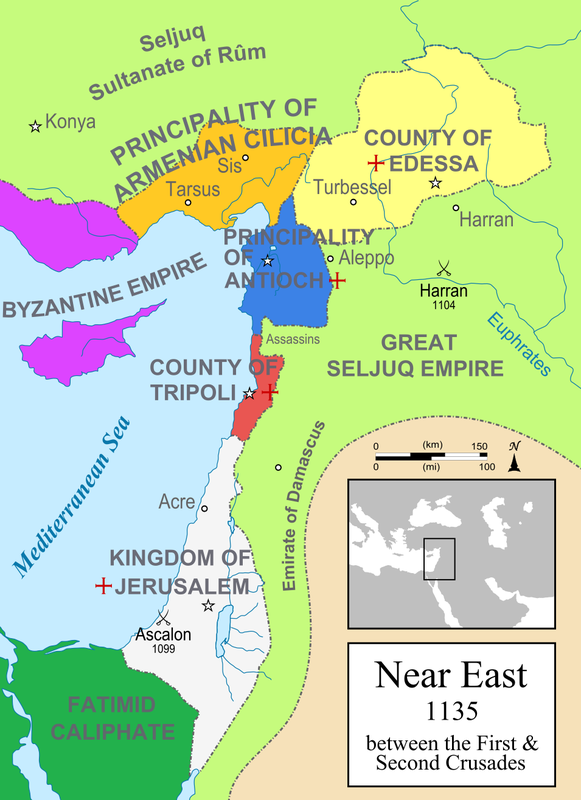 At the moment, Jerusalem, Antioch, Tripoli, and what was left of Edessa were being governed by women. Baldwin must have felt outnumbered by his female relatives. Now a grown man, Baldwin had been chafing for a while at the reins his mother kept him under. But Melisende wasn’t interested in abdicating in his favor. If she had been regent, instead of queen by inheritance, there would have been no question of her stepping down. Baldwin would have ruled alone from the age of about fifteen. The fact that it took another two years for him to attempt to take sole power may say something about his abilities and Melisende’s. His military career had been a series of failures. He had not yet married. But at the time that he and Melisende were at the council in Tripoli, he was already planning a palace coup. Melisende had fought many battles in her life. She had successfully resisted the attempts of her husband to shut her out of the government. She had supervised the reconstruction of Jerusalem and several fortresses between the city and Muslim territory. 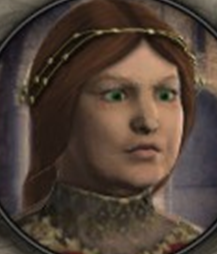 For five years past her son’s coming of age, she had ruled the kingdom. By all contemporary accounts, she was a competent ruler. What she had no way to fight was the blackening of her reputation by later historians. In the twentieth century alone, she has been called a “power-hungry Queen Dowager and “an authoritarian, even vindictive, woman.” Eminent Crusade historian Hans Eberhard Mayer, in the only serious monograph written on Melisende’s rule, persists in calling her the “Queen Mother.” While he admits that Baldwin’s military career had been a series of defeats, he still sees Melisende as woman who plotted to keep her son from power. In other words, as Baldwin’s opposition to his mother grew, most of the nobility moved to his side because he was male, but it was acknowledged that Melisende did have the right to rule with him or on her own. The secrecy of this act indicates to me either that he didn’t want Melisende to make a scene, which would accord with the negative opinions of her, or that he knew that her supporters would protest and perhaps stop the coronation altogether. After much negotiating, Baldwin and Melisende agreed to split the kingdom. He would have Tyre and Acre and she Jerusalem and Nablus, a town that, I believe, had been Morfia’s dower land. Melisende retired for the time being to Nablus. This division didn’t last for long. Considering the pressure being exerted upon the Latins by Nur ad-Din, it wasn’t feasible to have two competing governments. Melisende had many supporters. Not least among them was her younger son, Amalric. At the moment he was the count of Jaffa, the old county of Hugh of Le Puiset. There is little mention of Amalric up to this point. He is mentioned in a few of his mother’s charters but I have none that he issued alone. William, who was writing for Amalric, puts the blame for Baldwin’s actions on friends of his who had conceived a hatred not of Melisende, but of her constable, Manasses. He insists that they were responsible for what happened next. It wasn’t enough, he says, to make her divide the kingdom, “Not even in this was the persecution against the queen stilled. On the contrary, the still-smoldering fire was rekindled on trivial pretexts and blazed forth into a conflagration far more dangerous than before.” At the instigation of his friends, Baldwin demanded that Melisende give up all her land to him. Baldwin and his followers, many from the area around Tyre, such as the Ibelin family, set out to besiege Melisende in Jerusalem. She and her supporters, including Aimery, Philip of Nablus, and the Templar Andrew of Montbard, took refuge in the Tower of David. Baldwin fired at her with catapults but didn’t make a dent in the fortifications. This bombardment lasted a few days when the Patriarch of Jerusalem, along with other neutral parties, intervened. They managed to convince Melisende to surrender Jerusalem to her son and retire to Nablus. Baldwin swore that he would not bother her there in any way. Baldwin III at last was sole ruler of Jerusalem. From France, Abbot Bernard wrote Melisende that he had heard rumors of her troubles. There must have been negative gossip about her determination to keep power. In the light of the recent civil war in England over the right of Henry I’s daughter, Matilda, to the throne, people may have had a jaundiced view of female rule. Bernard tells her that he might have believed the stories if not for a letter from his uncle, Andrew of Montbard, explaining the situation and praising her behavior. The abbot gives her what encouragement he can. Melisende did not issue any more charters without the assent of Baldwin, much as Fulk had done after his abortive attempt to assert his power. But the mother and son seem to have had some sort of reconciliation. She was his mother, after all. Amalric and Phillip of Nablus also re-entered Baldwin’s circle. After the death of his wife, Phillip joined the Templars and eventually became grand master. Always loyal to the family, Phillip eventually retired from the Templars at Amalric’s request and died on a mission to Constantinople in the king’s service. Historians have seen Melisende’s actions through a lens of centuries of primogeniture. If she had been male, then Baldwin would have been seen as an upstart and a traitor. As it was, it is clear that there were many who were satisfied with her governance and not comfortable with allowing Baldwin complete control. None of the chroniclers living at that time in the Near East have said that she was power hungry. In a time and place where nearly every ruler spent most of his time trying to expand his territory, she was fairly consistent. If her son’s forays into enemy territory had been successful, she might have decided on graceful retirement. Or she might have arranged, like Emperor Alexis and his mother, that he handle military matters and she run the home front. But one thing still makes me wonder: why wasn’t Baldwin married as a teenager? Even if he had been homosexual, he could have done his duty and produced heirs, as other homosexual kings had done. I haven’t found any reference to ambassadors making the rounds looking for acceptable brides. Was Melisende so determined to hold onto her son that she didn’t want to compete with a wife? I doubt it. Baldwin didn’t marry until 1158, long after Melisende had lost control over his actions. It took the urging of the Haut Court, made up of the nobility of the realm, before he agreed to take a wife. His bride was Theodora, a cousin of Emperor Manuel. She was about thirteen at the time of the marriage and very probably did not speak French or Arabic. The couple had no children in the five years of their marriage. William of Tyre doesn’t even mention that Baldwin III had a wife. What made Baldwin wait so long to marry? Was something wrong with him that no one would talk about? Unless new sources are uncovered, I’m doomed to ignorance. There is no indication that Melisende was relegated to a backwater, nor that her followers were punished. By 1152, both Philip of Nablus and Amalric are witnessing Baldwin’s charters. That same year Melisende adjudicated between citizens and canons of Nablus, “with the consent of her sons, King Baldwin and Amalric, Count of Jaffa.” By 1154, she even appears again in Baldwin’s charters, giving her consent to one of his donations. In 1153, Baldwin finally succeeded in capturing that long-desired prize of Ascalon. He must have been elated to have achieved a goal that all the previous kings of Jerusalem had attempted and failed. This made the threat of attack from Egypt negligible and sealed Baldwin’s status. Nur ad-Din did not come to the aid of Ascalon as his father had; he was busy taking control of Damascus. While Baldwin was away, Melisende returned to Jerusalem as regent, or perhaps she saw it as taking up her rightful duties once more. But she went back to Nablus after Baldwin’s triumphal return. Melisende continued to keep an eye on the kingdom from Nablus. She remained a patron of artists and religious institutions. Her last charter is from 1160, in which she gives property to the monastery at Josaphat. But sometime later that year, she had a stroke that left her helpless. Yvette, now abbess, brought her to the convent of Bethany that Melisende had founded for her. By that time, Fulk’s daughter, Sybille, had come to Jerusalem and also entered the convent. They, along with Hodierna, “watched over her with unremitting care,” until her death in 1161. She was buried at the abbey of Josephat, near the tomb of her mother. Her elder son Baldwin survived her by only a year. Her second son, Amalric, became king. Melisende has been considered as someone who put her own ambition above the good of her kingdom and her son. I disagree. Baldwin III was a capable king, eventually, but he needed to grow into the role. If he had been competent at the beginning, then she might have been willing to step aside for him. But why should she have done so? Melisende was queen of Jerusalem and she was good at her job. She, her sister Alice, and too many other women who governed have been slandered and ignored, not by the people of their own time, but by later historians, up to the present day. William was mistaken only in that Melisende’s strength was not uncommon. Her mother and sisters demonstrate such strength, as did many others, including the woman who walked alone into an enemy camp to retrieve her stolen child. Melisende’s legacy was in setting an example for another generation. She only had three grandchildren, two girls and a boy. Her grandson was the tragic leper king, Baldwin IV. Amalric’s two daughters, Sybille and Isabella, each became queen. Alice’s daughter, Constance, ruled Antioch until well after her son Bohemond had come of age. Eventually he had to prove he could rule before she would retire to Latakia. The damage done by the failed Second Crusade led to the rise of the emir Saladin and the fall of the city of Jerusalem to him twenty years after Melisende’s death. 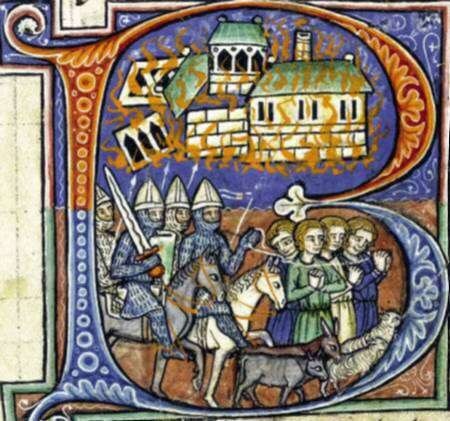 But the coastal cities remained in the hands of the Franks. The last foothold, Acre, survived until 1291. The histories of the Latin States have too often ignored the contribution made by women, and also the effects of the constant warfare on the diverse population of the region. A new look at the variety of peoples and the interactions among them, male and female, will not only revise our image of the Crusades but bring about a better understanding of conflicts in the Near East today.